After over a year of play, I've found the high levels of skill, failing only on a 1 in d12 or d20, are easily reached by a rogue or a gnome within a few levels, because those classes gain two skill points a level instead of one. I'm not against this in itself - it's good at a certain point to be reliable at such everyday things as sneaking or climbing up a building. The problem comes with trying to scale these super-skills to more difficult tasks. Even if you interpret the -2 for a hard skill as applying to skill ranks and not the die roll, a rogue who started with 3 in a skill and concentrated on it through level 3, getting 7 marks and having a base d20, can meet a hard skill with only a 1/6 chance of failing. I came up with this system which I think is not just more elegant, but could be the dead-simple engine for a whole game if applied to things like combat (although Paolo camped a stone's throw away a while ago, with something that eventually became 5MORE...). Instead of using different dice at high ranks of skill, once past 5 marks, you start adding on Reroll marks that let you reroll a failure on that skill every time you use it. Importantly, this anchors the highest level of skill at 5 in 6, with hard tasks, at -2, having a natural maximum of 3 in 6. On the other side, rerolls can be gained by getting bonuses above 5 marks; for example, if you have two marks in Stealth, but you are sneaking around in your native (background) terrain and the thick terrain makes it easy to hide, the +2 for background and +2 for easy task give you six marks: 5/6 success and one reroll in case that fails. A side bonus is that the same die is used for all skill rolls, eliminating the confusion of switching around to different dice that I've see new players thrown off by. If you want to set some tasks as near-impossible, they would be at -4: 1 in 6 for a master-level skillsperson, and even someone with two rerolls would be not at all sure of getting it. The other fix is that rogues get an extra skill box per level but they must split the two, allowing more even advancement. I'm not even sure this is entirely necessary. 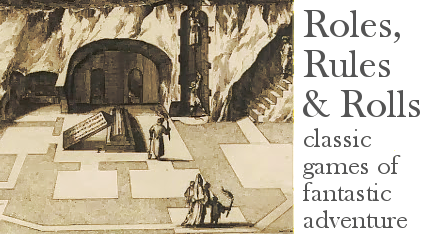 The two groups I game with are unusual in that they each have 3 rogue or rogue-like gnome characters, so each one can specialize (and has) and it looks like they have the whole gamut covered even at level 4 or 5. Lone rogues in a party may instead find it more efficient to spread their skills out more. The richest place in my formative years was the lending library in my well-funded, open-minded suburban hometown. It was there I laid hands on the Arkham House Lovecraft volumes, everything Tolkien and post-Tolkien, science fiction novels I wasn't even close to understanding but enjoyed anyway, the Holmes edition of D&D, the Monster Manual. Of these weird materials, some promised a regulation or explanation of the fantastic world - D&D, of course, laying down the rules of fantasy in a way that the heroes of Pratt and DeCamp's Compleat Enchanter series did, with arcane mathematics. The world of Shannara proved nothing more than a post-apocalypse, and Larry Niven's fantasy world was physics by another name. But I also read Lovecraft, Borges' book of imaginary beings, Dunsany, Brian Froud -- fantasists who made no excuses or explanations. 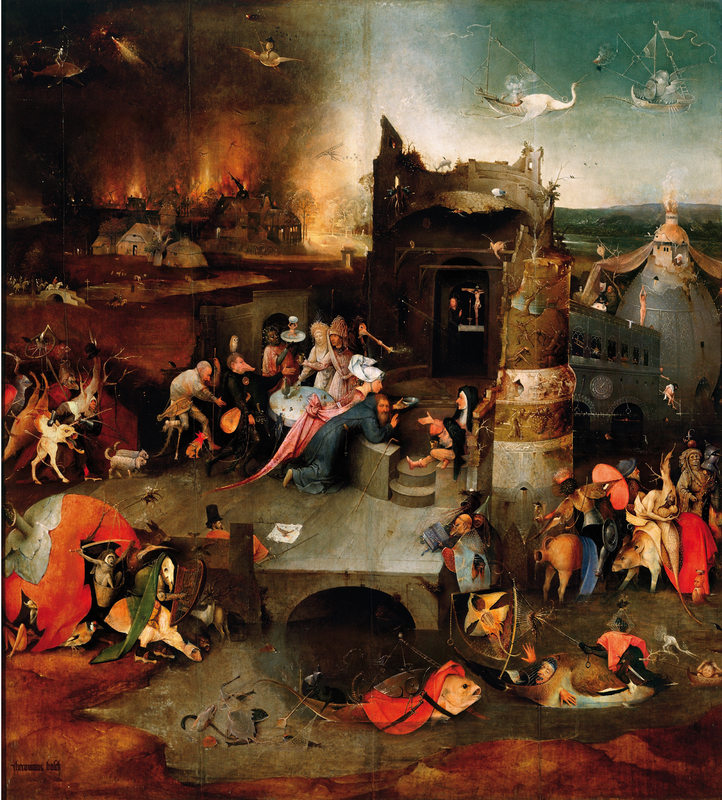 Tying them all together with a visual language of strangeness were the great coffee-table volumes of art where I became acquainted with Hieronymus Bosch. His devils drew from Church iconography, but there was the fantastic and even science-fictional in his ceramic-like architectures, his mutant creatures, flying farragos and garish colors. In my imagination he was as much an illustrator of weird tales as Sidney Sime or Lee Brown Coye. What matter that those tales were not written -- not yet? Which brings me to my undying fascination with the central panel of Bosch's Temptation of Saint Anthony. Here it is (it gets really big when you click it, and click again). It hasn't got the symmetries and tapestry-like coverage of the Garden of Earthly Delights, or either of his Last Judgments. There is dynamism, scene, progression, the varied freaks converging on a parody of a Mass laid on a dicing table. Others join the haphazard choir underfoot, or flit overhead. There is that bizarre ruin with its mess of perspective; the disasters in the background -- fire, war, demons -- while nonchalant or dazed washerwomen go down to the filthy water. Weird symbolism abounds and, as with Bosch's other works, has prompted all sorts of theories about his hidden message: alchemical is it? more broadly esoteric? or politico-religious? nationalist? If his figures illustrate proverbs and expressions that have faded with time, perhaps this is just another form of random generation to create compelling monsters, like the tree-archer with his gauntlets and brace of armored hounds. Me, I see an adventure here. The first stirrings of this in my gamemastering career happened a couple of years ago when I populated one level of my custom upper works for Castle of the Mad Archmage with a collection of Bosch's creatures, mostly from the Temptation, and somewhat differently imagined than presented here. The Muleteers have had several run-ins with them, all terrifying but none decisive. As this year's One Page Dungeon Contest approached its Walpurgisnacht deadline, I started to consider adapting this level, which uses a standard maze of rooms and passages. But after thinking I ended up favoring the original outdoors setting with its bulbous ruin, its convergence of monsters, its holy man looking serenely if a little desperately out of the frame, as if to say "Look! These are no figments of my fast, no color trails from ergot-laced crusts! You see them too!" I set the action a few minutes before the scene in the painting. 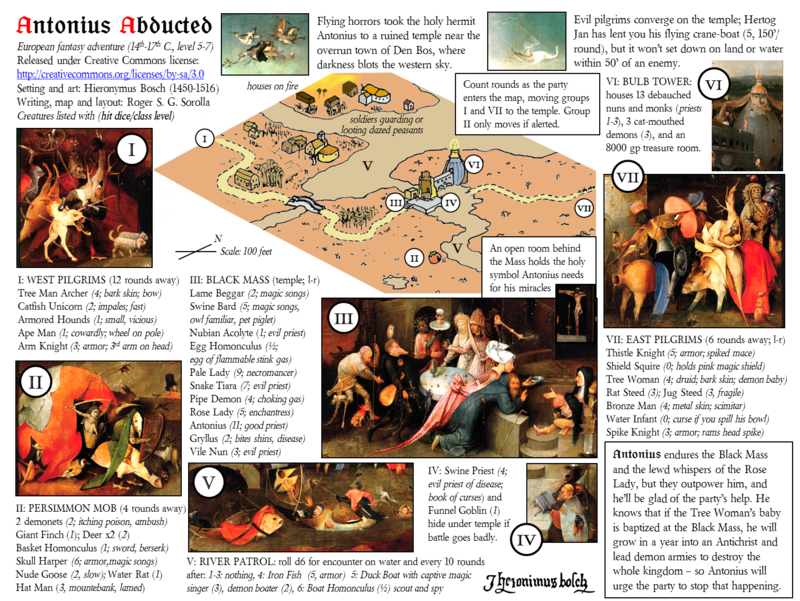 A tactical problem, asking for the various approaching demon-groups to be defeated in detail or confronted as they appear in the main action. Antony needs his crucifix to be of any use, so that's an action task to retrieve it on the scene. There wasn't really space on the page for a random table with all the skulking lizards, birds, demonlings and flying menaces you see in the art, but the water holds a few such perils. To calculate the state of human rights, the analysts consider the price of an AK-47. The less it costs, the more human rights violations there are, an indication that civil rights are gangrening and the state is falling to pieces. 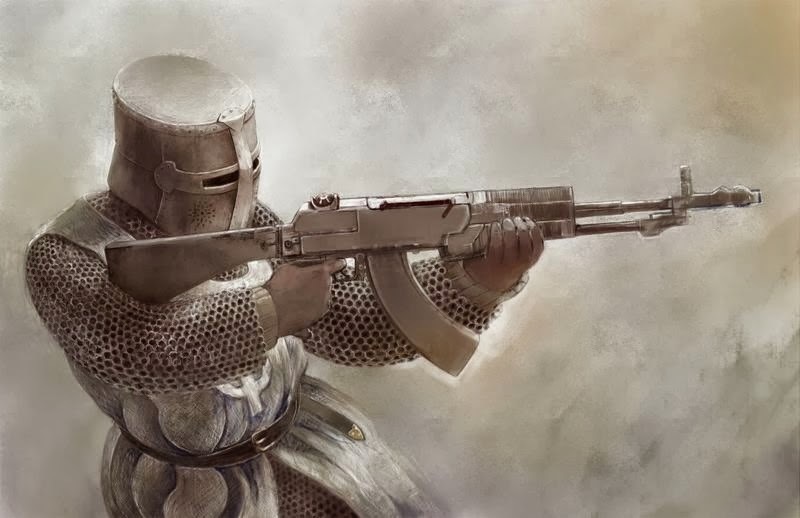 It's made me rethink the usual scheme by which the party adventures out in the boondocks but then has to travel to the big civilized city to get the best deals, or any deals, on the materials of war: weapons, armor, foot-soldiers, and in a fantasy world, usable items like potions or battle charms. But what if the opposite logic holds true? What if the best ratio of supply to demand is not found in the big city, which has to stay peaceful and organized to attract trade and reap taxes, where the state is strong, and men, arms and magic are regulated - and as a consequence, arms are sold only in black markets at greatly inflated prices? What if instead the deals are to be found on the borders of civilization, where swords and mail are regularly looted from the slain? Stocks in the house of war have to be high, for any day now a warlord could strut by looking to garrison a castle or equip a company. And if magic items are bought and sold, the ones useful in a fight are more likely to command a good price in a place where the line between life and death is as clear as the sea's horizon. And human rights violations. Of course your adventurers (read; your players) are not the kind who would burn a hut to shake loose a few copper pieces, kill cows for experience points, right? But guess what, other adventurers are. And just as much as you lay waste the orcs, the orcs are equipped to lay waste the village, which means that they too have their hidden source of cheap arms and provisions. Consider: have the adventurers gotten to a point where they turn their nose up at loading a mule with the fallen goblins'crappy hauberks and scimitars? There are those on the other side who do not. You may even meet them someday.